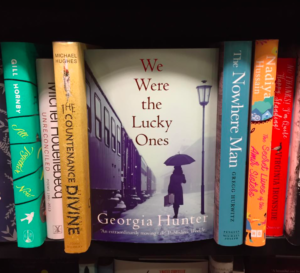 WWTLO in Waterstones (UK) – thank you, Kate, for the photo! It’s official. “Pub Day” as they call it here in the States, has arrived. 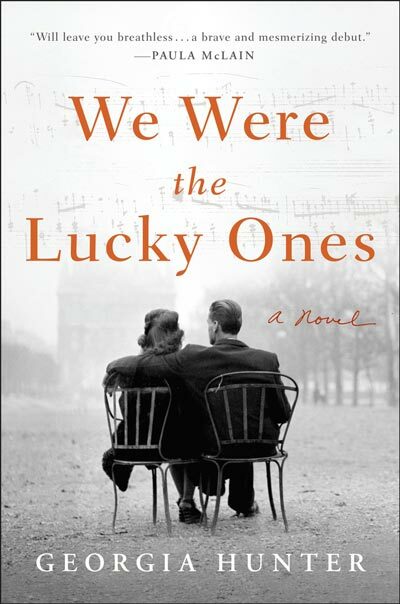 We Were the Lucky Ones has landed in bookstores (and on Kindle & Audible) across the U.S. and in the U.K., and might have even landed on your doorstep (as it did mine just a few minutes ago! ), if you pre-ordered a copy. While I thought I was ready for this moment—it’s only been nine years in the making—nothing, truly, could have prepared me for the tremendous outpouring of love and support I’ve received today. This morning, I told myself to find ways to pass the day slowly, mindfully. I stopped by an art supply store to pick out the perfect pen for book signings (talk about surreal!). I met my mother for a celebratory lunch. 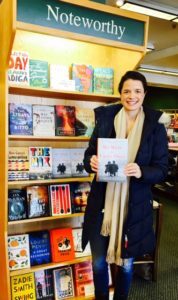 I visited my local independent bookstore to see with my own eyes my novel, perched on a shelf. In a few hours, I’ll head to dinner with my family and we’ll raise a glass to the Kurcs, and to all that’s gone into unearthing and recording their story. It’s been a day, as my grandfather would have mused, for the books. To the friends whose calls and texts and emails I can barely keep up with…to the brilliant teams at Viking, The Book Group, Allison & Busby, and The Jenny Meyer Literary Agency who have worked tirelessly to shepherd this book into the world…to the authors, bloggers, and media who have put out mind-blowing reviews, interviews, and Q&A’s (most recently, Tara Leigh, Sarah’s Book Shelves, Reading with Robin, and Newsweek magazine)…and to my family: my parents, Tom and Isabelle, my husband Robert, and my son Wyatt…and to the relatives near and far who I’ve relied upon in countless ways throughout the life of this project—thank you for all that you’ve done to help bring this labor of love to fruition. 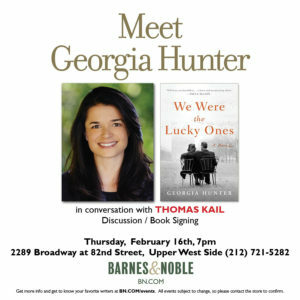 On Thursday night, I’ll kick off my book tour at Barnes & Noble in New York City, where I’ll share the stage with my good pal Tommy Kail (director of Hamilton)—and I’ll have the honor of doing so with the support of some 75 friends and relatives in the audience. With family flying in from Brazil, France, Oakland, Chicago, Miami, and Virginia (of my grandfather’s five siblings, four will be represented by their children, grandchildren, and great-grandchildren), and with friends in from as far away as Vancouver, BC, it will certainly be a night to remember. To everyone who will be there—I couldn’t be more excited to share such a special evening with you. I’ll be in touch with details on upcoming events and readings. In the meantime I’ll sign off by wishing you all a happy Valentine’s Day. I personally can’t think of a sweeter, more meaningful gift this Valentine’s than to know that my family’s story—a story of courage, perseverance and love—is out, finally, for the world to read.